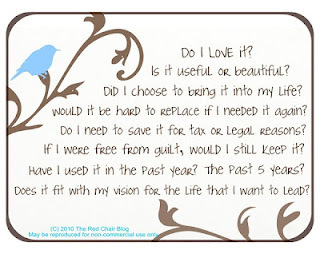 I found this while browsing online for clutter quote images. Thank you Amy from The Red Chair Blog for creating it. This quote is a good reminder of questions we should ask ourselves when going through our belongings. The last one in particular stands out because it makes you think of the kind of life you are envisioning for yourself and not just your current situation. Now, on to the rest of the post. A year after I graduated, I was on a mission to declutter my life from things that were taking up room in my home that served no real purpose for me anymore. I went through every category of stuff: books/textbooks, past school notes and file bins, financial statements, clothing, souvenirs, stationary, hobbies/crafts, cards/letters/notes, and gifts/purchases that were not being used/loved. As I went through my stuff, it was easiest to focus on things to give away first. I used Craigslist to try to sell a few items that were brand new but decided in the end I just wanted these out of the house asap without having to coordinate meetups so I donated the rest to Goodwill. In my research on where to donate items, I came across an non-profit organization called Freecycle. Freecycling allows you to give away things or ask for things from other members for free. It sounded like a really good idea to me and I’ve been a Freecycle member since then. My only giveaway so far on Freecyle was my four sandwich toaster (A toaster that toasts 4 sandwiches at once). My sister meant very well when she got me one because she knew I loved toasted sandwiches. I had shared with her a childhood memory of being blown away when I saw someone’s sandwich toaster in action. I saw my friend place a whole sandwich into this toaster, press down and her sandwich came out toasted with the ends sealed – the crusts of the sandwich flatten and essentially seal the sandwich (like a pocket). I should’ve been thrilled when I saw my gift but a part of me was afraid I wouldn’t use it. And that’s what happend. I used it only once – right after she bought it for me and then I never used it again. It was big and I only ever made one sandwich at a time. I also felt like when I was at home, the last thing I actually wanted to eat was a sandwich, I’d much rather eat well…anything else. Don’t get me wrong, I love me a hot sandwich, I would just rather have something more substantial. I decided the only reason I was keeping the sandwich toaster was because it was a gift, but I would never use it. So I called my sister to explain that although it was a great gift idea, I wasn’t using it and I’d rather give it to someone that will. She was fine with it, so I didn’t feel guilty. I remember meeting a Freecycler dad to give away my sandwich toaster, he said he was thrilled to be able to use it for his daughters who had been asking for one. It felt really good to give it away to someone knowing it was going to be used and enjoyed rather than sitting in a box in my home. My first request on Freecyle was for ramekins. I wanted to make flan and I just fell in love with the idea of having beautiful white ramekins to bake them in. I would see them in stores but would hesitate about buying because I was afraid that I wouldn’t use them. I decided I’d try asking for this on the Freecycle board and a lady responded to my post. When I met her she said she was happy to give them away because she was no longer using them. This was a big decluttering project and it was a good reminder that I should regularly purge so that it doesn’t become so overwhelming and time consuming. Ever since, I’ve been doing it at least twice a year. What are your thoughts on clutter? Do you regularly purge your home of things you no longer want/need?